AdoNuxt project template for Nuxt.js with Adonis.js. - Vue.js Feed AdoNuxt project template for Nuxt.js with Adonis.js. AdoNuxt project template for Nuxt.js with Adonis.js. 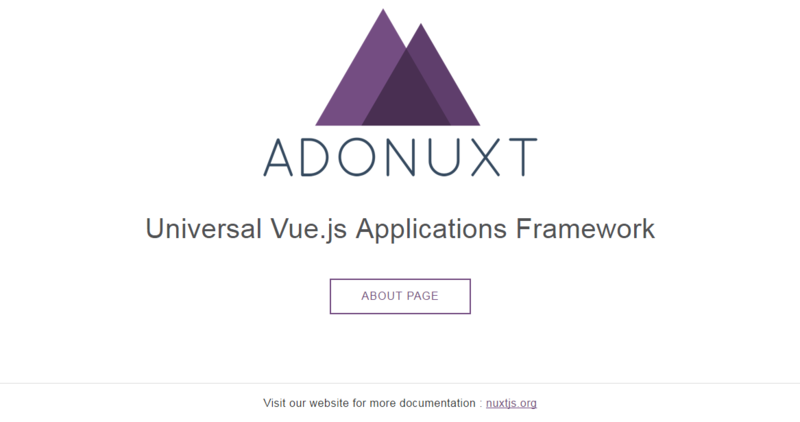 Adonis is an MVC Framework for Node.js to write webapps with less code and Nuxt helps you create universal Vue.js Applications. Adonuxt is a project combing features from both Adonis.js and Nuxt.js. This will result in a new project with the following structure. Adonuxt has no more public directory, but resources/static/ instead, and no resources/views directory. Also, the nuxt.config.js file is now in config/nuxt.js. At Nuxt there is available documentation. Adonuxt on GitHub. Created by the Nuxt team.